The Dingo Broom is a fantastic labour saver that can be found working in a variety of environments including car parks, cattle sale yards, shopping malls, mine workshops, parks and gardens. 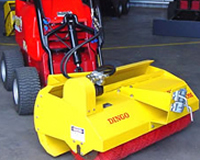 Dingo's unique 2 circuit hydraulic system allows the broom speed, and ground speed to be varied independently to suit the debris being swept. This speed variation means that the Dingo broom is suited to sweeping debris ranging from dust to blue metal. The Polypropylene bristles are made from 100% Australian materials in Australia to Dingo's exacting specifications and quality. The Dingo Broom-Bucket sweeps 1.2 metres wide and can collect 50 litres of rubbish (more if consistency allows). It can then carry the rubbish to a standard industrial bin and tip it in. The Broom-Blade combo consists of a broom section mounted onto a standard tilt blade. The blade allows the sweepings to be wind rowed where required, or to sweep straight ahead. Depth is controlled by a front mounted jockey wheel so speed can be obtained without the broom "biting in". The Broom adaption for the 1200mm 4in1 Bucket (K9-4 only) is a simple and cheap way to convert you 4in1 Bucket into a Broom. The Brooms sweeps a full 1200mm with the added bonus of being attached to the 4in1 bucket allowing a greater dump height when emptying the bucket. often used in conjunction with road profiler and poly planner. Used By: Landscapers, factories, councils, road maintenance companies.